Brother detectives Frank and Joe face perils in the wilderness as they try to track down their missing teacher in this thrilling Hardy Boys adventure. As part of a research unit, Bayport High’s Green Environment Conservation Club (GECO) is taking a field trip—camping on nearby Black Bear Mountain, where the students will help field biologist Dr. Max Kroopnik investigate local flora. Frank’s there to geek out about nature while Joe’s along for the thrills. Not only does Black Bear Mountain live up to its name—the fierce furry animals are everywhere—but rumor has it that a madman lurks in the forest, and the crazy dude has a penchant for feasting on human flesh. The Hardys scoff at the urban legend, but the rest of their class isn’t so convinced. When the campers wake up, however, not only do they find a bear roaming the campsite, but their teacher is missing…and blood is streaked across the front of his tent. The GECOs are stranded alone in the wilderness with no technology, no way to call for help, and, quite possibly, a madman on the loose. Luckily, Frank and Joe have a good amount of survival skills under their belt. 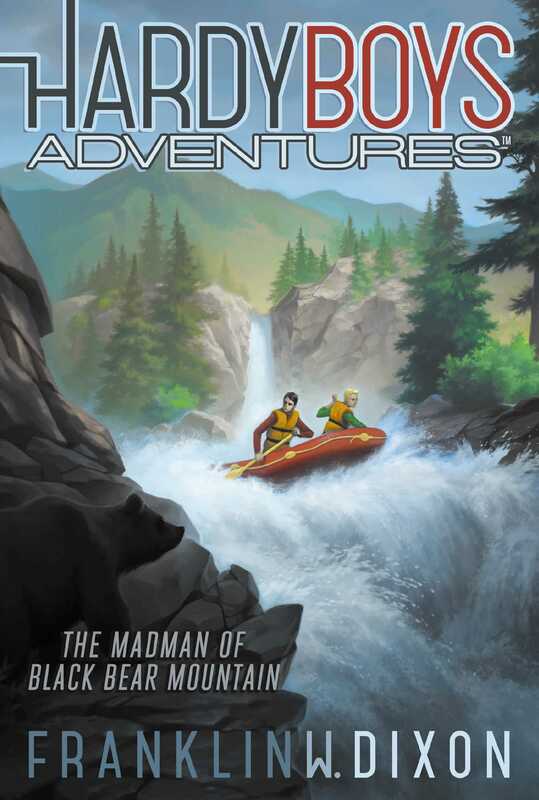 But when they venture in search of their teacher, they find themselves hunted by a mysterious axe-wielding man in face paint and bearskins, falling into dangerous rapids, and perched on the edge of a precarious waterfall. Will the Hardys be able to find their teacher and make it back to the campsite alive? I COULD STILL HEAR MY brother’s screams echoing across the river valley as a woman with a bear-paw tattoo shoved me off the ledge and sent me hurtling after him. My body rocketed through the atmosphere at fifty miles per hour, with the wind punching me in the face so hard, my eyes watered. Just when it seemed like I might plummet to my death, I started zipping straight ahead, my feet gliding over the treetops like I was surfing on air. Only this wasn’t a dream or a video game. It was spring break! The zip line shot me over a lush mountain valley toward the rustic lodge just across the river where Frank and the rest of the Bayport High Green Environment Conservation Club (GECC, or, as we liked to call ourselves, the Geccos) were getting ready for our camping expedition to a nearby scientific research station. From my bird’s-eye view, I could see all the way upstream past a thundering waterfall and miles of rolling hills to our destination atop the tallest, most forbidding peak, Black Bear Mountain. “Yee-haw!” I hollered as I zipped over the river toward the landing platform. Normally, I wouldn’t get this excited about spending spring break on a school trip with one of Frank’s nerdy clubs, but most nerdy school trips don’t involve staying someplace as cool as Bear Foot Lodge for part of it. They also don’t usually include a pair of girls as cute as “the Ms,” which was what everyone called BFFs Mandy and Melissa. I’d been trying to catch Mandy’s eye, and I know Melissa had already caught Frank’s. I’d talked him into doing the zip line to impress her, but judging from how loudly he’d screamed and how pale he was when I reached the bottom, I think my plan may have backfired. “Why did I let you talk me into that?” he asked as I unhooked myself from the zip line’s harness. “That’s because you guys are a couple of total nerds,” Melissa said, playfully pushing her best friend. Oh no! It looked like Frank and I had crushes on the wrong Ms! We’d arrived at Bear Foot Lodge the previous afternoon, and today we were scheduled to head up to Black Bear Mountain. While helping noted biologist Dr. Kroopnik with his field research for a few days, we’d be camping out in the woods. Randall must have ignored the part about us roughing it in the woods, because he was still wearing his standard prepster combo of brand-new sneakers and a cardigan draped over his shoulders. With his attitude, he should have just worn a wet blanket instead. “Yeah, Randall, you’re just grumpy because we voted Frank club president instead of you,” Mandy said. “Who’s ready for some science!” GECC faculty adviser Jim shouted through an armload of camping gear as he stumbled toward us. He seemed to be carrying more stuff than he could handle. Frank and Mandy whooped it up. “Assisting Dr. Kroopnik with his field research is going to be a great experience for you guys. I—Ayeeee!” Jim tripped over his feet before he could finish, sending both him and the gear flying. That was Jim Morgan in a nutshell, full of more enthusiasm than grace. Jim—who insisted students call him by his first name—had been at Bayport High for only a couple of semesters, but he was already one of the students’ favorite teachers—partly because he was a great teacher and partly because he was endlessly entertaining. You never knew when he might accidentally set the chem lab on fire or walk into a wall absentmindedly while pondering an exciting new lesson plan. “His article on the effects of carbon emissions on endangered species in high-elevation river ecosystems has led to a whole new way of thinking about mountain preservation,” Frank eagerly added. Melissa and I caught each other rolling our eyes at the same time and laughed. “Incoming!” a woman’s voice called out as Casey, one half of the young couple who owned Bear Foot Lodge, whooshed toward us on the zip line. “You guys did great up there,” she said, unhooking herself from the zip line and hopping off the platform. “Your tattoo is wicked, Casey.” Melissa pointed at the bear paw on Casey’s forearm below the rolled-up sleeve of her red plaid lumberjack shirt. Not that Casey looked like a lumberjack. With her long blond hair, bright smile, and trendy sunglasses, she looked more like an outdoor clothing catalog model. “I’m game,” I said, thinking about how cool it would be to put my mountain-climbing skills to the test. “But what about Dr. Kroopnik?” Frank protested. Jim was interrupted by a bang so loud, it sounded like a gunshot. We turned to see a beat-up old boat of a red convertible backfiring as it squealed around the corner and swerved up the drive toward the lodge at top speed. The driver slammed on the brakes at the last second, plowing through a pair of trash cans before coming to a stop a few feet from the porch. The guy who stumbled out had on big green-tinted aviator glasses and quite possibly the brightest, ugliest Hawaiian shirt I’d ever seen. He took off his floppy hat, scratched his shiny bald dome, and let out a loud belch that we could hear all the way across the field. “Um, who’s that?” Jim asked Casey.